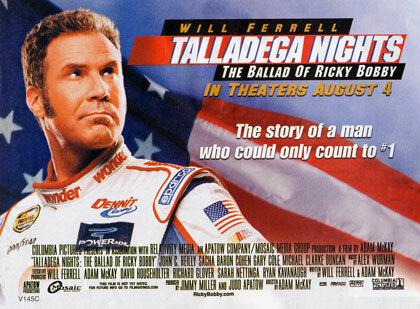 The latest Netflix envelope ad is for the Will Smith Ferrell movie Talladega Nights: The Ballad of Ricky Bobby. "The latest Netflix envelope ad is for the Will Smith movie Talladega Nights: The Ballad of Ricky Bobby." Will Smith??? Do you mean Will Ferrell?? I have never even heard of this, but after seeing Anchorman, I will definetely add this to my clue. Will Farrell is so freakin' funny in whatever he does, but seeing him star in his own version of Days of Thunder sounds like comedic gold. To each his own. I've never liked Ferrell in anything I've seen him in. One of his biggest bombs was Night at the Roxbury. Chris Kattan is also highly over-rated, IMO. He's been in one bomb after another. Corky Romano, anyone? I've had no real interest in seeing the crap these two dorks have done. I can't see their appeal, or Owen Wilson's, or Vince Vaughn's, or Ben Stiller's. Blargh! What has the world come to when no-talent bums like these get a movie coming out every other month?